If you have ever downloaded an M3U file thinking you were going to get a song, audio file, or podcast, you’ve probably noticed the file size is tiny, and the m3u doesn’t really do anything on it’s own. This leads many users to wonder how to play the audio file, or how to convert that m3u into an mp3, m4a, or turn it into another familiar audio format. M3u’s are fairly misunderstood in that sense, they’re actually just a plain text playlist container file that is either a local playlist of audio, or a simple URL (link) to the actual audio content, usually intended to play as an audio stream. Playing the audio from an m3u is made easy with iTunes, but perhaps more useful is getting the actual audio files out of an m3u container by downloading the source audio to a local hard drive. We’ll cover how to do both. iTunes usually knows what to do with an M3U file, so just open the m3u directly into iTunes to start the audio playback through streaming. It may take a moment to start loading depending on the speed of the internet connection. 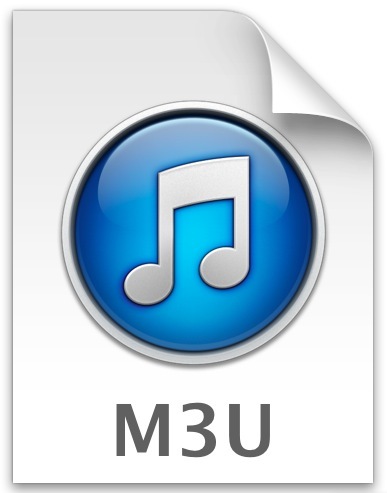 Once an m3u has been opened in iTunes, they will be categorized under the “Internet Songs” section of the library, even if the m3u is a podcast or not music. The downside to keeping the m3u file through iTunes directly is that it will stream every time the audio is accessed, meaning it won’t be available if internet connections are down or the server is out of reach. That’s why downloading the audio content from the m3u container can be useful. You can often download the m3u playlist audio files directly to a computer, this prevents having to stream the audio through the M3U container. Accordingly, that means you can only “convert” m3u files into local mp3 / m4a files if the container is a URL to audio. If the file is a playlist of local documents, it is not actionable in this way. You can view the contents of any m3u with any general text editor. OS X makes this particularly simple with TextEdit, the bundled text app, or with Quick Look if you have text selection enabled. Simply drag the m3u file into TextEdit or open it with Quick Look, and you’ll see what’s in the m3u container, which is either a link to a file or a playlist. Once you have the URL from the m3u playlist, you can then download it locally. Most users will want to use the web browser to accomplish this, but you can also turn to the command line to download the contents from the m3u as well. Downloading the contents through a web browser is going to be easiest for most users, it should work with any modern browser in any modern OS, be it Safari, Chrome, or Firefox. You’ll probably want to save the resulting mp3 or m4a somewhere easily accessible, like the desktop. Once it’s done downloading, you can open it directly into iTunes where it will reside with the rest of your audio playlist. curl will start downloading the file, showing download speed and progress. When finished, it’ll be where you executed the command, which is typically in the user ~/ home directory. Whether you downloaded the file through a web browser of the command line doesn’t really matter, but you’ll now have the audio file stored locally, preventing the m3u container from streaming the document every time it’s opened or retrieved. 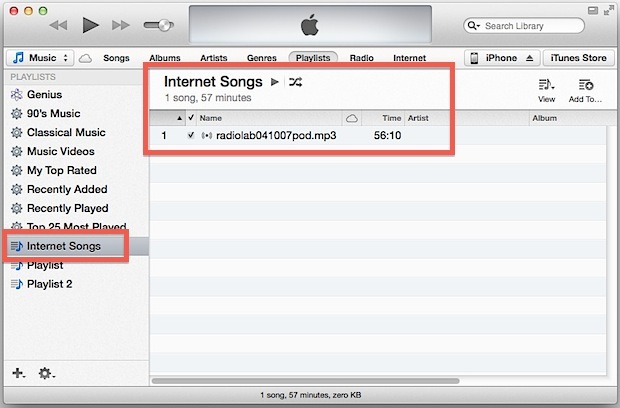 This can be helpful if you’d rather load up your iPhone, iPad, iPod, or computer with audio files like podcasts rather than relying on the streaming functionality, so just load it directly into iTunes and enjoy. Hi, reading this suggests to me that m3u is basically a file to be played on apple products, is that correct? I only have and will only have, for the foreseeable future anyway, windows media player, which seems unable to open and stream these m3u files. first off, am I wrong about these only being apple files? second, is it possible to convert them, or their stream in the case of live stream? What’s a solution? No, m3u is a link to an online stream. They are not unique to any environment or product. “M3u’s are fairly misunderstood in that sense, they’re actually just a plain text playlist container file that is either a local playlist of audio, or a simple URL (link) to the actual audio content, usually intended to play as an audio stream. Bill, I assume you had a hard time reading because you’ve badly misunderstood the whole article. 1. (Monetary) extortion is a crime, and when you buy music on iTunes it’s yours to copy and redownload as much as you want, though there is a limit of 5 devices on your iTunes account which applies to Mac/iPad/iPhone only. Not sure what you’re getting at here. 3. You CAN’T hide anything with M3U files anyway, they are plain text. Just like you can’t hide the recipients address of your letter, because it has to be right on the front of the envelope so they know where to send it. Where is ‘hiding anything with M3U files’ coming from? On a Mac you can use the Chrome browser to save an MP3 file by pasting the URL into the address bar and using Save Page As to save the MP3 file to a location of your choice. This does not work with the Safari browser which will only save as Page Source or Web Archive.